This review contains spoilers for previous book. Since fleeing Winternest to avoid King Hablet’s wrath when he discovers the truth about her parentage, leaving her slave, Charisee, to take her place, Rakaia has been on quite an adventure. She has met the demon child, traveled the continent with the charming minstrel, Mica the Magnificent, enjoying more freedom then she ever imagined trapped in the harem in Talabar. But her freedom has come at a cost. Mica has committed an unthinkable crime, worse even, than stealing the golden lyre, and she is now his unwilling accomplice, sailing the high seas on a Tri-lander pirate ship, doing everything she can to avoid upsetting the man she once thought she loved, but has now realized is quite insane. Meanwhile, Charisee, still pretending to be Rakaia, is trying to make the best of her new life as the Lady of Highcastle. But Rakaia’s past will catch up with her, even as her own lies are in danger of being exposed. As Adrina struggles to hold Hythria together, and Marla tries to deal with the fallout from the shocking events that take place in the Citadel during the treaty negotiations, Wrayan Lightfinger and the apprentice sorcerer, Julika Hawksword, must travel to Sanctuary to find out why the fortress is back. What they will discover is shocking and will affect the entire world, even though they don’t realize it. The Lyre Thief was one of my favourite books of 2016, so I was delighted to get the opportunity to review the sequel. It didn’t disappoint. Being an epic fantasy, the book has a large cast of characters. I didn’t stop to reread the first book, instead choosing to dive in. It was a bit of an effort to remember who everyone was, but I soon got my feet under me. The book also has a cast of characters in the back to help, should you need it. One thing I loved most about this series is that there are women everywhere. Most of the POV characters are female and they drive the action forward at every turn. Although the setting is a generically medieval-influenced fantasy comprised largely of patriarchal societies, the author uses her female characters to examine this set-up and to undermine it to some extent. Sophany and Rakaia are caught in relationships with dangerous and abusive men. Both try to protect people they care about and influence the situation by playing to very traditionally feminine roles. This provides an interesting contrast to Charisee and Adrina, both of whom are more secure in their power, even if it is borrowed from their husbands. These two women use this power to defy the patriarchy more directly, to varying degrees of success. These women are without their flaws. Some of the minor female characters are downright horrible. And, as with the first book, the POV characters often act selfishly–but this is often a short step from survival and it’s never the sum of who they are. There’s always someone they care about and this helps them to remain likable. There are a few places where the book wears its influences plainly. This was most notable when a childish king declared it was his mission to drive out the elves and make his nation great again. The story is dark at times, so this may not be the best choice for readers looking for a light escape. 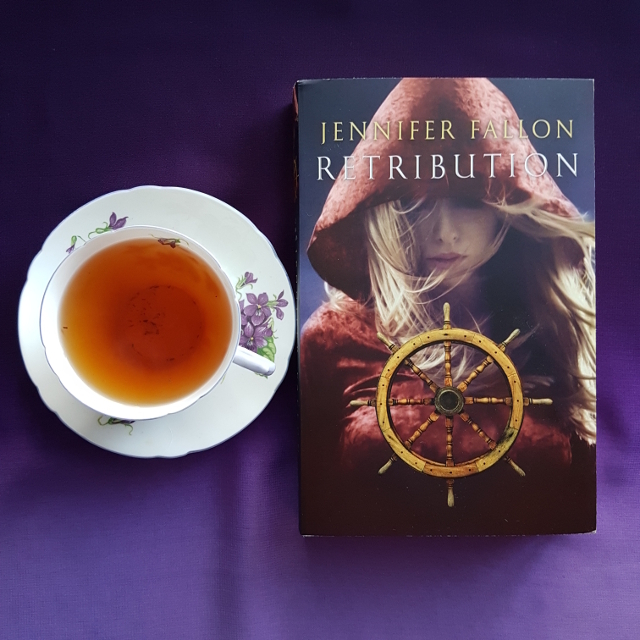 However, if you’re looking for a more hopeful, more feminist alternative to A Song of Ice and Fire, Retribution may be the book for you.